Stuart at Early Warning has an update on oil prices - the rumoured glut of energy hasn't made itself apparent on the charts thus far - Oil Prices. A while since we've looked at oil prices around here. 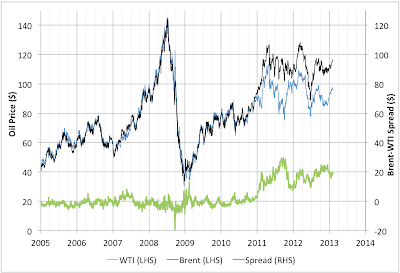 The chart above shows the two main benchmarks - Brent and WTI - and the spread between them. These days Brent is a better indicator of global oil market conditions, as well as gas prices on the US coasts, while the spread of WTI to Brent is mainly measuring the fact that the boom in tight-oil production in the central US cannot be fully bought to market conveniently yet. Brent prices have been in and around the $100-$120/barrel band since the beginning of 2011. For the last few months they've been rising and are currently somewhat above the 2011-2013 average. If the supply flatness of 2012 continues, I'd expect them to climb quite a bit more. However, it's not clear to me whether that supply flatness will continue.